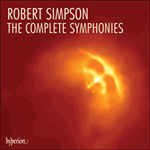 The Fourth Symphony was completed in 1972 when Robert Simpson was fifty-one. With a duration of over forty minutes it was his largest work to date in terms of scale, archictecture and sheer boldness of symphonic invention. Since the first performance, which was conducted by James Loughran with the Hall‚ Orchestra, the composer has revised the slow movement by quickening the pulse from Adagio to Andante, altering the contours of the cello solo near the beginning, and directing the final climax to be hushed. There are additional smaller revisions also, mainly concerning instrumentation and balance. Simpson's No 4 is a classical E flat Symphony, so much so that the Scherzo and slow movement are in the dominant and subdominant keys respectively, whilst the outer movements are firmly rooted in E flat. It is arguably Simpson's most friendly, good-humoured symphony, and the one that seems to bear the strongest spiritual affinity with his great hero, Beethoven. The orchestral requirements are notably larger than in the Second Symphony: 3 flutes, all of which double piccolo (a device also used in the Third Symphony), 2 each of oboes, clarinets and bassoons, double-bassoon, 4 horns, 4 trumpets (2 in B flat, 2 in D), 3 trombones, tuba, side drum, cymbals, timpani and strings. The opening 'Allegro moderato' is fresh, buoyant and transparently scored throughout; indeed, the composer once suggested that he might have been subconciously recalling the sound world of the first movement of Nielsen' s Sixth Symphony (Sinfonia Semplice). Perfect fourths play a crucial part in the opening movement, as they do in the entire symphony, and this is immediately evident in the Symphony's first phrase, announced on violins and cellos. This is not a sonata-allegro in the traditional sense, but the initial statement does reappear frequently as the music continually evolves and develops. Only at the end is a brief climax reached, but this suddenly disappears, leaving the strings to settle on a bare fifth (E flat and B flat) as fragments of former themes are wittily scattered around in all directions. The titanic second movement is a tour de force. 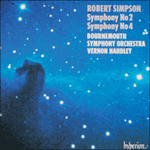 It is Simpson's first symphonic scherzo, though no listener would sense this when experiencing the massive confidence and breathtaking energy that this music unleashes. Again the influence of Beethoven is felt, in this case the 'Molto vivace' from the Ninth Symphony. Both works adopt a vigorous one-in-a-bar pulse, are cast in fully developed sonata form, with the first part repeated, and are examples of the most massive orchestral scherzi in symphonic literature. Simpson's central Trio is equally remarkable: a quotation from the first movement of Haydn's Symphony No 76 appears, alternating with mounting interjections. The interjections grow in strength and ferocity, but the Haydn remains innocent and unaffected despite the surrounding turbulence. The last and most shattering interjection leads directly back to the Scherzo, which is not a da capo repeat as in Beethovenian scherzi; the material is all familiar but the music now develops in fascinating new directions. The Andante begins quietly, mysteriously, before introducing a long, deeply contemplative solo cello melody supported by delicate, slowly evolving string accompaniement. The tempo remains unaltered in the extended central section, heralded by a noble horn solo, though the bars are shortened from 4/4 to 6/8. Here serene, graceful counterpoint floats past, the texture is still transparent and the mood warmly expressive. After a sudden pause, and hushed piano on full orchestra, the music relaxes into the original 4/4 pulse for a shortened reprise of the first section, the original ideas now reduced to the barest essentials. The Finale begins attacca and is for the most part a free recapitulation of the first movement, though now converted into a swinging, triple-time metre. The orchestration is more full-blooded and weighty. Again, the interval of the fourth is prominent, and throughout this Finale the first movement's themes undergo continual transformation and metamorphosis, both rhythmically and melodically, so as to gain new vitality and create new energy. Whereas the first movement faded away at the end, the coda of the Finale actually begins with a delightful, innocent, waltz-like tune on second violins, demonstrating a supreme gift for melodic simplicity and directness that Haydn would surely admire. This coda is long, cumulative, and generates immense excitement. A final crescendo is built, the music flexes its muscles — that is to say by expanding and contracting its phrase-lengths — and even elements of the Scherzo are introduced to add fuel to the fire. The composer has described this closing section as 'full of fierce joy' when the final bars blast out a powerful transformation of the Symphony's opening phrase.